Amazon Echo smart speakers are leading the charge in terms of sheer numbers finding their way into our homes, and for good reason, they come in a variety of sizes, qualities, and with prices for every budget. The range may have started with the original Amazon Echo, but that was a few years ago now, and there are now five different devices on offer (and that's the conservative number). There are Echos with screens in the Amazon Echo Show and Amazon Echo Spot, with smart home hub features in the Amazon Echo Plus, and for the conscious in the Amazon Echo Dot. Confused? We don't blame you. So here’s our ranking of the Amazon Echo lineup as it currently stands. We’ve divided the list into two sections, screen-less and screen-equipped, and we've omitted the left-field Amazon Echo Look because it's just so different from the rest of the lineup. 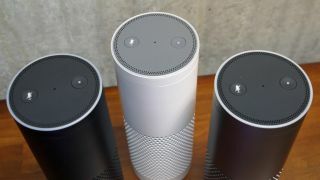 Note that while all the devices featured here are available in the US, some have yet to be released outside the US, and Amazon has yet to launch its Echo range in some countries. The new version of the Amazon Echo made a number of changes compared to its predecessor. It switched to using a pair of buttons to control volume, it replaced its matt plastic in favor of fabric, wood and metallic finishes, and it added a 3.5mm jack to allow it to be hardwired into an external speaker. It's also the perfect entry point into the Amazon Echo ecosystem. It might lack the bigger sound and smart home hub of the larger Plus, but we wouldn't say the price difference is quite worth the improvement. The Amazon Echo Dot is a much smaller version of the Amazon Echo, and is around the size of a hockey puck. There have actually been two generations of the Echo Dot released, with the second ditching the volume dial in favor of two dedicated volume buttons. The Dot’s size meant some compromises on sound quality had to be made, resulting in a sound level that’s fairly weak and tinny and unsuitable for playing music. However, an included 3.5mm jack means that it’s perfectly possible to connect the speaker to an external sound system if you want to get your tunes playing, and you can also connect to a Bluetooth speaker. We wouldn't advise you to buy this speaker if you want to do a lot of music listening, but if you want to try out Alexa on the cheap, or you're buying it for non-music tasks, then the Dot is a fantastic budget buy. The Amazon Echo Plus is similar in appearance to the original first-generation Amazon Echo. Under the hood, however, a number of improvements have been made, and the most significant of these is the addition of a ZigBee-compatible hub. Zigbee is the connection protocol used by a number of different smart home devices, which usually come with a hub that must be plugged into your router in order to allow them to function. Having a hub inside the Echo itself means you no longer need this additional hub plugged into your router. In theory, so long as your Echo is connected to your home network then your smart home devices will function. In practice, however, smart home functionality is limited when using the built-in hub, and so you'll probably want to keep using an external hub to get the most out of your devices. Combined with the price premium, the Amazon Echo Plus offers probably the weakest value proposition of the three screen-less speakers. Weight: 1170g | Size: 187 x 187 x 90 mm | Drivers: 2 x 2.0" full-range drivers | Aux-out: No | ZigBee smart home hub: No | Screen: 7"
The first Echo device to be equipped with a screen, the Amazon Echo Show is able to show you a wealth of information that would be impossible on a regular Amazon Echo. As well as displaying visual information, the Show is also capable of playing video content from a variety of sources including, of course, Amazon Prime Video. The screen can also be used for video calls, or to stream a video feed from compatible smart cameras. We're not convinced Amazon has built in enough screen-enabled functionality to make its screen a must-have inclusion, but what it can do it does competently. Weight: 419g | Size: 104 x 97 x 91 mm | Drivers: 1.4" full-range driver | Aux-out: Yes | ZigBee smart home hub: No | Screen: 2.5"
The Amazon Echo Spot is a miniature version of the Show, replacing the 7-inch rectangular screen of the Show with a 2.5-inch circular screen. This smaller screen means the device is less useful as a video-watching device. Although this is still supported, the round screen doesn't lend itself that well to long-form video viewing. Instead, you’re more likely to use the screen to read messages, show virtual clock-faces, or conduct video calls. The Spot's small size also means the built-in speaker isn’t as good as the larger Show’s. But, in our brief tests with the device, it is better than its small form factor would have you believe.